Recovery from addiction doesn’t happen overnight. People in recovery learn to take life one day at a time. You can help them by making donations one month at a time. With an automatic, tax-deductible gift each month, you can help empower clients to lead fulfilling, addiction-free lives. Our #OneMonthAtATime gift program makes your ongoing support of Harmony’s work easier for you. Invest in recovery #OneMonthAtATime, simplify your ongoing support, and transform lives. Invest in recovery one month at a time. 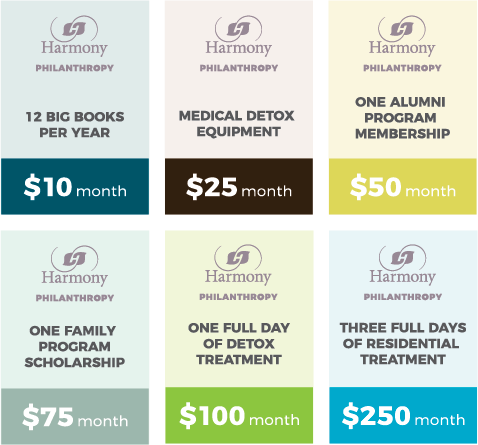 Join Harmony’s #OneMonthAtATime gift program of supporters who make automatic recurring donations. With a monthly gift, you can help people build a life of sustained recovery. You will join an extraordinary group of people who are an uninterrupted source of vital assistance for clients working to recover and thrive. Your contribution can fund everything from copies of the 12-Step Big Book to treatment scholarships. Thanks to you, Harmony has a 49-year history of ensuring that everyone we serve—regardless of age, income, gender, or background—has an opportunity to regain their lives. Together, we make a difference.